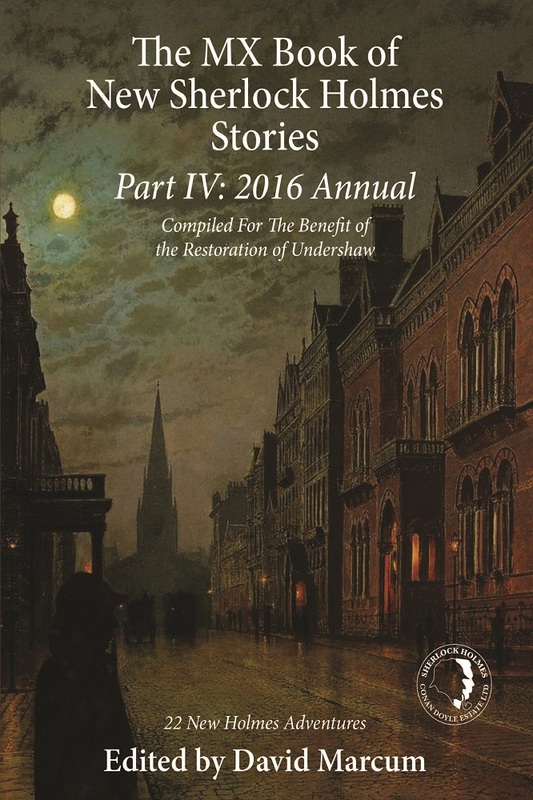 “This book is the fourth in a series of Sherlockian anthology volumes from MX Publications and the new title addition indicated that the publisher plan to continue this remarkable series. All of the authors have donated their royalties for this publication to the support of Undershaw. It includes twenty-two short stories and novellas as well as a poem. The poem is a “Toast to Mrs. Watson,” by Arlene Mantin Levy, written as a series of rhymed couplets. “The Tale of the First Adventure” is a short story by Derrick Belanger that tells how Sherlock learned to restrict the details he passes on to clients in his first real case. In “The adventure of the Turkish Cypher,” a short story by Deanna Baran, Holmes uncovers a poisoning, but avoids telling his client the details behind it. “The Adventure of the Missing Necklace,” a short story by Daniel D. Victor, recounts how Holmes acquired his distaste for fictionalized versions of his cases. “The Case of the Rondel Dagger” is a novella by Mark Mower that tells of Holmes’ investigation of murder by minions of an ancient secret society, or so it would seem. In “The Adventure of the Double-edged Hoard,” a novella by Craig Janacek, Holmes is introduced to an ancient and horrible relic of the Viking raiders. “The Adventure of the Impossible Murders” is a short story by Jayantika Ganguly that tells of suspiciously related natural deaths caused by unlikely murderers. “The Watcher in the Woods” is a novella by Dennis O. Smith that tells of a strange case Holmes accepted involving alchemy and a disappearing watcher of a house of madness. “Relating to One of My Old Cases,” a short story by J. R. Campbell, links two recent murders to one Holmes investigated years before with unanswered questions. “The Adventure at Beau Soleil,” a short story by Bonnie MacBird, relates an incident in Nice when Holmes aids a house detective in return for lodgings for him and Watson. “The Adventure of the Phantom Coachman” is a short story by Arthur Hall that mixes spies, thieves and phantoms all in a single muddle for Holmes to untangle. “The Adventure of the Arsenic Dumplings,” a short story by Bob Byrne, tells of a cook arrested for attempted murder and convicted in public opinion by non-existent evidence. “The Disappearing Anarchist Trick,” a novella by Andrew Lane, pits Holmes and Watson against a magician in a case investigated for Mycroft. “The Adventure of the Grace Chalice” is a radio script by Roger Johnson that was first aired in 2011. It was developed from his short story published in “The Sherlock Holmes Journal” (WI/1987) and tells of Henry Staunton, as cited in “The Adventure of the Missing Three-Quarter”. “The Adventure of John Vincent Harden,” a short story by Hugh Ashton, most effectively tells of a case cited in “The Adventure of the Solitary Cyclist”. “Murder at Tragere House,” a short story by David Stuart Davies, tells a chilling tale of murder and madness in Scotland. In “The Adventure of the Green Lady,” a short story by Vincent W. Wright, Holmes is hired by an American to confirm the theft/replacement of a newly acquired painting. In “The Adventure of the Fellow Traveller,” a novella by Daniel McGachey, Holmes is drawn into an inspiring mystery of horror, love and hope. In “A Game of Illusion,” a novella by Jeremy Branton Holstein, Holmes is defeated by an unknown adversary in a game he does not know he is playing. “The London Wheel” is a novella by David Marcum that tells of an early Ferris wheel in London and the murder that it inspired. “The Adventure of the Half-Melted Wolf,” a complex novella by Marcia Wilson, tells of relics of Roman Britain that give guides for twentieth Century war technology stolen by a traitor. This fourth volume continues the tradition set by the first three books in the series. The twenty-three items in this book include twice as many that I rate as excellent as the few I rate only as good. All the rest I rate as very good and that gives the entire volume a rating of “excellent” as compared to any other Anthology.” The MX Books of New Sherlock Holmes Stories are available from all good bookstores including The Strand Magazine, Amazon USA, Amazon UK, Waterstones UK and for free shipping worldwide Book Depository . In ebook format it is in Kindle, Kobo, Nook and Apple iBooks (iPad/iPhone).